BURLINGTON, Vt., Oct. 17, 2017 /PRNewswire/ -- Ben & Jerry's is excited to introduce its newest Limited Batch flavor, One Sweet World—a delicious blend of coffee caramel ice cream with swirls of marshmallow and salted caramel with chocolaty chunks. 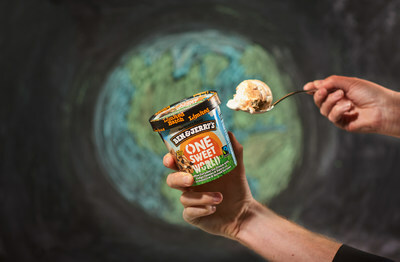 Ben & Jerry's latest flavor, One Sweet World, is part of the company's campaign for social and economic justice. Ben & Jerry's One Sweet World is a delicious blend of coffee caramel ice cream with swirls of marshmallow and salted caramel with chocolaty chunks. This euphoric pint is filled with more than just chunks and swirls – it's a small part of Ben & Jerry's larger effort to advance issues of social and economic justice. "We believe that when people come together, particularity in this time of racial, economic and political divisions, we can create a more just, equitable, and yes, even a little bit sweeter world," said Ben & Jerry's CEO Jostein Solheim. 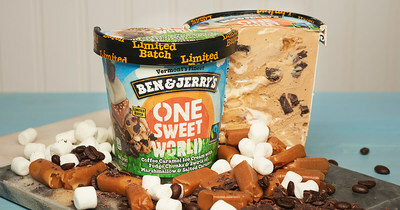 For more information on One Sweet World, visit Benjerry.com/onesweetworld. As an aspiring social justice company, Ben & Jerry's believes in a greater calling than simply making a profit for selling its goods. The company produces a wide variety of super-premium ice cream, yogurt and sorbet using high-quality ingredients. Ben & Jerry's incorporates its vision of Linked Prosperity into its business practices in a number of ways, including a focus on values-led sourcing. In 2015 the company completed its transition to using entirely non-GMO (genetically modified organisms) ingredients by source as well as to fully source Fairtrade-certified ingredients wherever possible, which benefits farmers in developing countries. Ben and Jerry's products are distributed in 35 countries in supermarkets, grocery stores, convenience stores, franchise Ben & Jerry's Scoop Shops, restaurants and other venues. Ben & Jerry's, a Vermont corporation and wholly-owned subsidiary of Unilever, operates its business on a three-part Mission Statement emphasizing product quality, economic reward and a commitment to the community. Ben & Jerry's became a certified B Corp (Benefit Corporation) in 2012. The Ben & Jerry's Foundation's employee-led grant programs totaled $2.5MM in 2016 to support grassroots organizing for social and environmental justice around the country. For the inside scoop on Ben & Jerry's visit www.benjerry.com.